Part number SLBYL. Model number X5675. Thermal Design Power 95 Watt. Thermal Grease included. Core steppings B1. The number of cores 6. Level 3 cache size 12 MB. Level 2 cache size 1.5 MB. CPU part numbers AT80614005130AA. Part number SLBV7. Model number X5670. Thermal Design Power 95 Watt. Thermal Grease included. Core steppings B1. Frequency 2933 MHz. Level 3 cache size 12 MB. Model : X5650 SLBV3 (AT80614004320AD). Clock speed : 2.667 GHz. Type Non-RAID Controller Card Brand Intel MPN Does Not Apply Compatible Port/Slot PCI Express x4 UPC Does not apply. Compatible X99 i7-6850K 6900K. 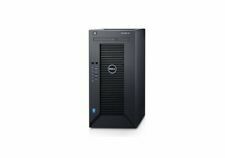 Dell Precision Rack Workstation, Dell PowerEdge Rack Servers: support v3 series CPUs with A1/L0/M0/R0 stepping, v3 series CPUs QS version or Product Version/ OEM version CPUs only. Model : E5-2697V3 SR1XF (CM8064401807100). Number of cores : 14. Stepping Code: SLBV3. Socket: LGA1366. Processor Number: X5650. L2 Cache: 12MB. SAN Storage. Processor Cores: 6. Bits (Instruction Set): 64 Bit. Hyper Threading: Yes. Xeon E5-2667 V2 SR19W x 1. Notes on sSpec SR19W. 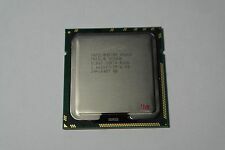 Processor number E5-2667 v2. Socket type Socket 2011 (LGA2011). Type CPU / Microprocessor. 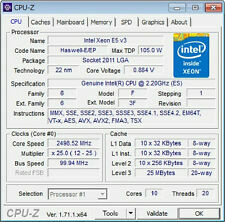 Processor core Ivy Bridge-EP. Core stepping M1. This microprocessor supports Turbo Boost Technology. Compatible X99 i7-6950X. ASRock: X99 series (all models with BIOS 3.00 or above or above). MSI: X99 Godlike Gaming Carbon (BIOS 2.4 or above). MSI: X99 Godlike Gaming (BIOS 1.6 or above). Note: A BIOS upgrade may be necessary for motherboards manufactured prior to the introduction of Xeon E5-2600 v4 series CPUs series. Stepping Code: SLBV6. Processor Number: X5660. Socket: LGA1366. L2 Cache: 12MB. 2.80GHz Hex Core Processors. SAN Storage. Processor Cores: 6. Matched Set of. Stepping Code: SR0L0. Socket: LGA2011. SAN Storage. Processor Number: E5-2690. Processor Cores: 8. Bits (Instruction Set): 64-Bit. You may be interested in. Hyper Threading: Yes. Model : E5-4650V2 SR1AG (CM8063501541700). Don't remove the mark of " Ibk " on below right side of CPU. Number of cores : 10. Stepping Code: SR0LL. Socket: LGA1356. Hex Core CPU Processor. SAN Storage. Processor Number: E5-2430L. Processor Cores: 6. Bits (Instruction Set): 64-Bit. Hyper Threading: Yes. Stepping Code: SR1AP. Socket: LGA2011. Processor Number: E5-1660 v2. SAN Storage. Processor Cores: 6. Bits (Instruction Set): 46 Bit. Hyper Threading: Yes. Bus Speed: 0GT/s. Stepping Code: SR19S. Socket: LGA1356. Cache: 25MB. Processor Number: E5-2470 v2. SAN Storage. Processor Cores: 10. Bits (Instruction Set): 64-Bit. You may be interested in. Model : 3-1280V3 SR150 (CM8064601467001). CPU part number CM8062000862604 is an OEM/tray microprocessor. Part number SR0LK. Processor core Sandy Bridge. Thermal Design Power 95 Watt. Thermal Grease included. Core stepping C2. Frequency 2400 MHz. Model : E5-4650L SR0QS (CM8062101229300). Stepping Code: SLBZ8. Processor Number: E5649. Matched Pair of. SAN Storage. Processor Cores: 6. Bits (Instruction Set): 64-Bit. RAID Cards. Graphics Cards. Socket: LGA3647. Stepping Code: QL1G. Cache: 11MB. Processor Number: 3106 ES. SAN Storage. Processor Cores: 8. Bits (Instruction Set): 64-Bit. You may be interested in. Stepping Code: SLBRJ. Socket: LGA1567. Processor Number: E7530. Cache: 12MB. SAN Storage. Processor Cores: 6. Hyper Threading: Yes. Max Turbo Speed: 2.133GHz. Stepping Code: SR1Y6. Processor Number: E5-2687W v3. SAN Storage. Processor Cores: 10. Bits (Instruction Set): 64-Bit. You may be interested in. Hyper Threading: Yes. Clock Speed: 3.10GHz. Stepping Code: SR20N. Processor Number: E5-1660 v3. SAN Storage. Processor Cores: 8. Bits (Instruction Set): 64-Bit. You may be interested in. Hyper Threading: Yes. Clock Speed: 3.00GHz. Stepping Code: SR1XF. Processor Number: E5-2697 v3. SAN Storage. Processor Cores: 14. Bits (Instruction Set): 64-Bit. You may be interested in. Hyper Threading: Yes. Clock Speed: 2.60GHz. Processor Type Xeon E5 2650 V4 ES QH2N. LGA2011-3 Compatible X99 i7-6900K. ASRock: X99 series (all models with BIOS 3.00 or above or above). MSI: X99 Godlike Gaming Carbon (BIOS 2.4 or above). MSI: X99 Godlike Gaming (BIOS 1.6 or above). Stepping Code: SR0KP. Socket: LGA2011. SAN Storage. Processor Number: E5-2667. Processor Cores: 6. Bits (Instruction Set): 64-Bit. You may be interested in. Hyper Threading: Yes. However, the manufacturer will then launch the BIOS update. Compatible X99 i7-6950X. ASRock: X99 series (all models with BIOS 3.00 or above or above). MSI: X99 Godlike Gaming Carbon (BIOS 2.4 or above). Model : E3-1220 SR00F (CM8062300921702).